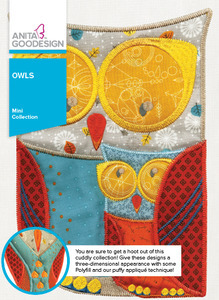 The idea behind this collection was to see what the owls would look like using puffy appliqué and a unique outline style. The finished designs were adorable with the added thickness of batting. Most of our designs go through an experiment, or Research & Development, phase to test different techniques and ideas. By doing these experiments, we are constantly coming up with new ways to create embroidery! The owls look great on any garment or project. 12 colorful owls in 3 sizes each (hoop sizes range from 6” x 10” to 8”x 12”).